Nick Mason’s Saucerful Of Secrets have announced a North American tour for next year. 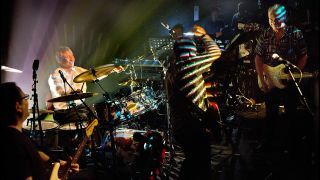 Mason is joined in the lineup by Gary Kemp, Guy Pratt, Lee Harris and Dom Beken, with the outfit playing a selection of early Pink Floyd material, including tracks from The Piper At The Gates Of Dawn and A Saucerful Of Secrets. Last month the band revealed a run of UK shows for April and May – and they’ve now announced a total of 25 shows across the US and Canada which will take place before the UK dates. Find a full list of live shows below. Speaking with Billboard last month, Mason admitted that revisiting Floyd’s early material wasn’t easy and called the process “challenging”. He said: “Being an eternal optimist, I thought it would just come straight back to me. Sadly, I was wrong. Once you start examining Syd Barrett’s work carefully, it’s quite often more complex than you expect. “It's not necessarily written like so many pop songs with an eight-bar section and the middle eights and whatever. It's quite often a completely different set of bar counts to what you're expecting.